The Dazzle Awards presented by Patricia and John Chapman are modeled after the Tony Awards® to recognize outstanding musical theater productions and students in Northeast, OH. The winners in the Best Actor and Best Actress category will have the opportunity to participate in the National High School Musical Theatre Awards in New York City. Malik Montgomery, winner of this year's Tischer Scholarship and Best Supporting Actor Award by Rotary, will compete for that chance to perform in NYC after receiving his nomination for Dazzle's 2018 Best Actor Award. 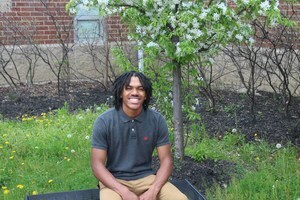 Malik, a senior, has been involved with the Arts at Harvey High School for several years. While his talent has certainly been recognized during his high school career, his blockbuster performance as Donkey in Shrek the Musical has earned him his first nomination for a Best Actor Award by Dazzle. This is also Harvey's first ever Best Actor nomination. Under the direction of Kim Hildack, Harvey High School has become a perennial powerhouse in the performing arts and musical theater. This is a tremendous accomplishment for our program and the future of the district's aspiring thespians. Malik's nomination amongst thousands of other students across Northeast, OH is not just a tremendous accomplishment for Malik, it's a game changer for Harvey Theater. Our elation and pride for how his work will impact the future oi Painesville City Schools is indescribable. Malik has already stolen the show in this community with his breathtaking performance, and we know he will capture the hearts of the judges when he performs at Dazzle a week from Saturday.. In addition to Malik, Samantha Tackett was nominated for and will compete for Best Featured Performer. She will perform in the opening and closing numbers alongside Andrea Ortega Sandoval, Estelania De Jesus, Malik Walker, and Marcus Mendez-Gibson.